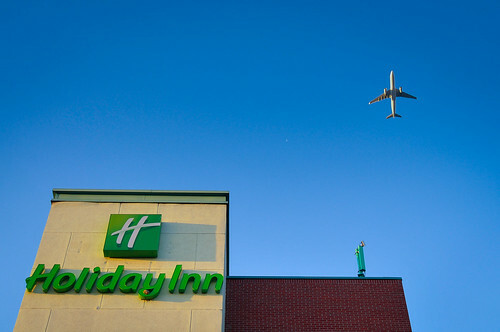 The Holiday Inn Toronto West in Mississauga is in the direct flight path to YYZ. I was trying out the new AFS 12-24mm f4.0 DX lens during a business trip to the Mississauga office. The planes were taking off that evening from behind the hotel, I could hear them coming, but I didn't have much time to grab shots as they appeared over the top of the hotel. If you look carefully, you can see another aircraft at cruising altitude near the middle of the frame. © 2013 Paul Chan - Canada. Photos are copyrighted. All rights reserved. Pictures can not be used without explicit permission by the creator.